Use the new Infra Red Burners to replace your existing burners to create your own searing zone in your firemagic grill! By replacing a set of existing burners (usually the two left side burners) with the new infra-red burners, you can create a grill that will sear a steak very quickly, sealing in the juices for that "steak house" experience without the price! Also great for quick-cooking thin pieces of meat like fajitas. OR replace all of your burners and you'll have a dedicated infra-red cooker! These burners may be added to any Firemagic grill. We can even replace them for you and ship your grill just the way you want it configured! 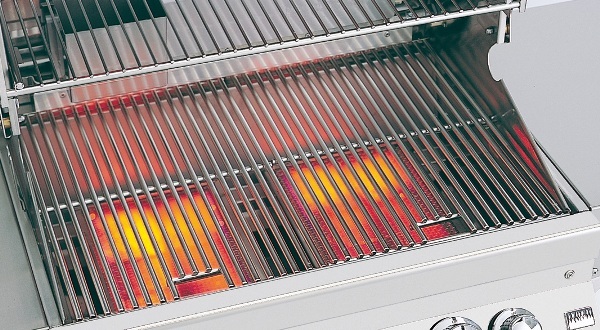 (Picture shows a grill with two infra-red burners installed).